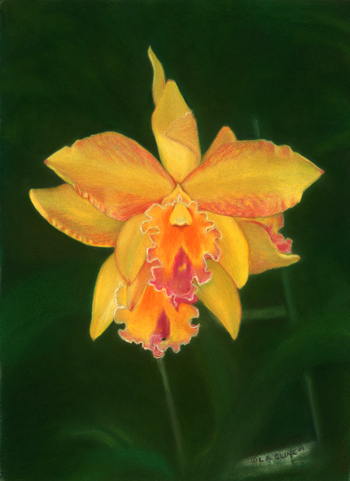 I first saw “Bellissima” this voluptuous Yellow Orchid in a pot under a low canopy of an avocado tree. I was mesmerized by its natural beauty and size that reached the height of 10 1/2″. The shade cast from the tree covered the plants and grass beneath it like a heavy blanket, muting all color to a dull tone. The one flower immune to this effect was this Cattleya Orchid radiating from under the tree like a morning sunrise. The Yellow was so bright I saw it from a block away and just kept walking towards it. I just had to take this beauty from nature and create the painting “Bellissima”. 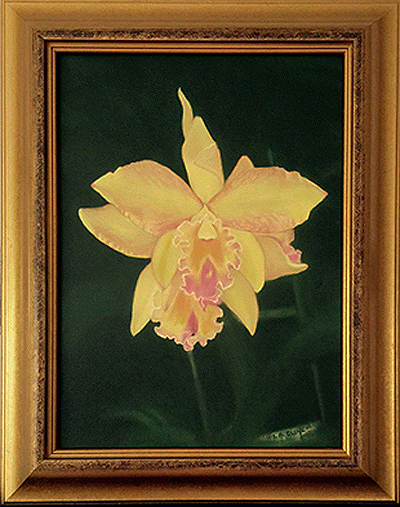 The yellows from this Cattleya orchid where so bright that they changed color throughout the day. As I hand painted the “Bellissima” Archival Digital Fine Art the same metamorphosis happened as the day changed the colors changed too. This “Bellissima” framed with a gold rounded profile frame with black etching all around the inside. I hand painted this unique one of a kind work of art. “Bellissima” was exhibited at Neiman Marcus Fort Lauderdale during their Trend Event and Artist Showing. I welcome any question you may have. Contact me directly.